Employees of QORF and partners supporting the competition and their immediate families are ineligible to enter. 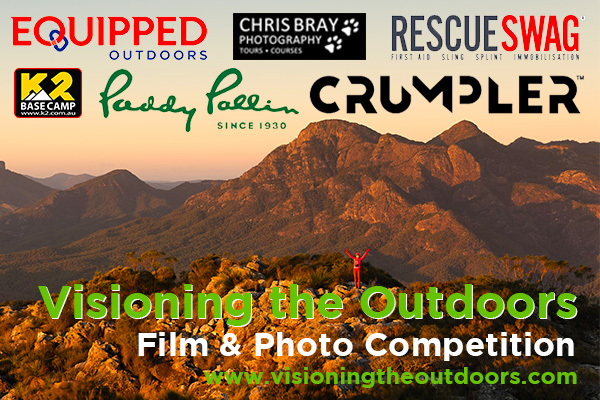 Entry in the Visioning the Outdoors Film and Photo Competition is free. All entries must be accompanied by an entry form. Entry for the competition is online through the competition website. QORF accepts no responsibility for late, lost or misdirected entries. Your submission must focus on people recreating in the outdoors and should reflect the theme Live Life Outdoors. Permission must be gained from all those whose images or voices appear in your film/s and/or photo/s before submission. You are required to indicate in the online registration form that permissions have been attained from participants in your film or subjects in your photos for their images and/or voices to be shown in public environments including online mediums. You must be able to supply all Image Use Consent Forms if requested. An Image Use Consent Form is available to download from the Visioning the Outdoors website, please ensure you gain permission from all people captured in your recordings/photography. By submitting a film or photos to Visioning the Outdoors Film and Photo Competition, you affirm you are the author of the work. If you are not the sole creator of your film or elements contained within your film/s and/or photo/s then you must first obtain permission or license from the owner/s before submitting your entry to the competition. Copyright and intellectual property of the submissions remain solely the property of the filmmaker/photographer. All entries must be submitted by close of business on the advertised closing date (Australian Eastern Standard Time). If you have technical difficulties uploading your film/s and/or photo/s, or filling in the entry form, contact QORF as soon as possible by email: industry@qorf.org.au to arrange an alternate method of submission. Film/Photo entries may not be retracted from the competition after the advertised closing date of the competition. You grant non-exclusive worldwide rights to your film/s and/or photo/s and all materials contained within and indemnify QORF, its agents and assigns*, against any losses or damage incurred through usage of your film/s and/or photo/s. You agree to allow your film/s and/or photo/s to be uploaded to the Visioning the Outdoors website, QORF website, QORF social media channels inc Facebook, Instagram and YouTube (QORFTV), for People’s Choice Voting and public viewing. You allow QORF, its agents and assigns to publicly screen your film/s and/or display your photograph/s free of any financial charges at associated screening and/or awards nights. You allow QORF, its agents and assigns to reproduce, publish and exhibit your film/s and/or photo/s without notice or payment for: promotional purposes of this competition, future competitions and the promotion and advocacy of the positive aspects & benefits of the outdoors in Queensland, except where a prize winner advises QORF otherwise. These uses may include (but are not limited to) reproduction on the internet, intranet, screen savers, websites, presentations, publications, and events. You authorise QORF, its agents and assigns to use your name and likeness in connection with any publicity for Visioning the Outdoors Film and Photo Competition and you agree to undertake publicity appearances as reasonably requested by QORF and partners supporting the competition. Copyright and intellectual property of the submitted images remain solely the property of the filmmaker/photographer. Disqualify an entry, which is not in accordance with these Terms and Conditions. Exclude film/s and/or photo/s from the competition, including People’s Choice and associated screening and awards nights, that we deem to be inappropriate for Visioning the Outdoors Film and Photo Competition, or that contain defamatory, libelous, derogatory or illegal content. Exclude film/s and/or photo/s that involve wilful environmental damage or that are harmful to animals, humans or public property. Entries in the Youth Category are restricted to entrants 16 years and under, determined as at the competition close date. Entries in this category must be predominantly the youth’s own work, with limited technical assistance provided by adults in the capacity of parents/carers and/or instructors. Where adults contribute to concept development and technical execution, we recommend a joint submission in the Open category. Entries in the Open Category are not age-limited. QORF, its agents and assigns supporting the competition will not be held responsible for ANY injuries sustained by those involved in the making or viewing of the film/s and/or photograph/s submitted to the Visioning the Outdoors Film and Photo Competition. You take risks of your own free will and QORF, its agents and assigns supporting the competition will not take responsibility for your actions. Written music copyright permission must be provided for all music that is NOT copyright-free. This is your responsibility and is a key requirement of entry to this competition. By submitting an entry, the entrant accepts that QORF, its agents and assigns may choose to sample, crop or use segments of the your film as needed for best presentation of the film, for use in promotional trailers and/or film clips / montages promoting outdoor recreation. No hard copy images will be accepted. Images must be a minimum of 1024 pixels and submitted as a JPEG (.jpg) file. Winning entrants may be asked to supply higher resolution images for publication purposes. By submitting an entry, the entrant accepts that QORF may choose to resize, resample, or crop the photograph as needed for best presentation of the original image.